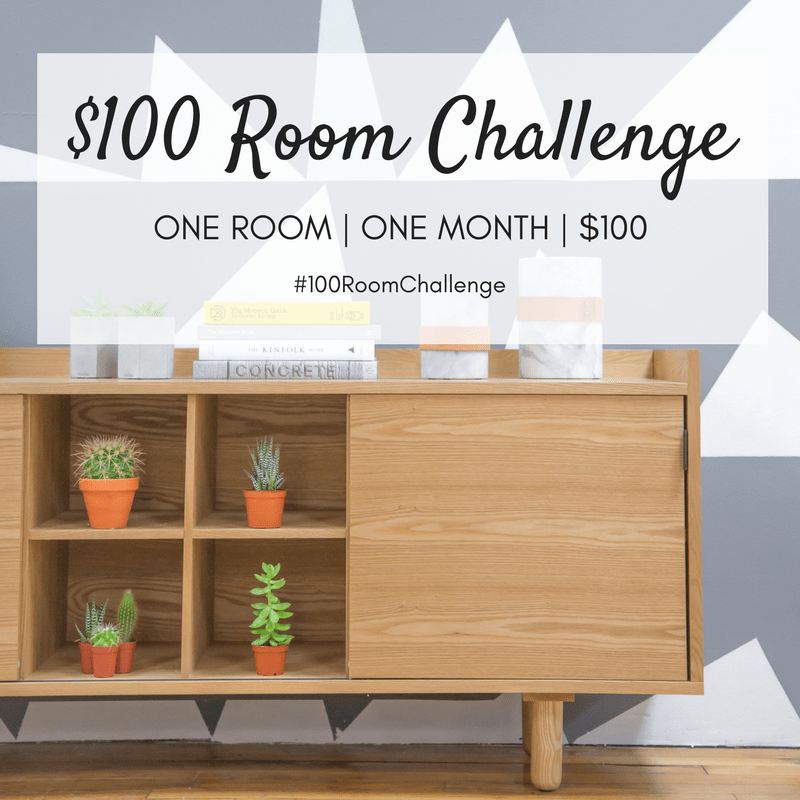 Hey all, it’s about that time for another $100 Room Challenge update! 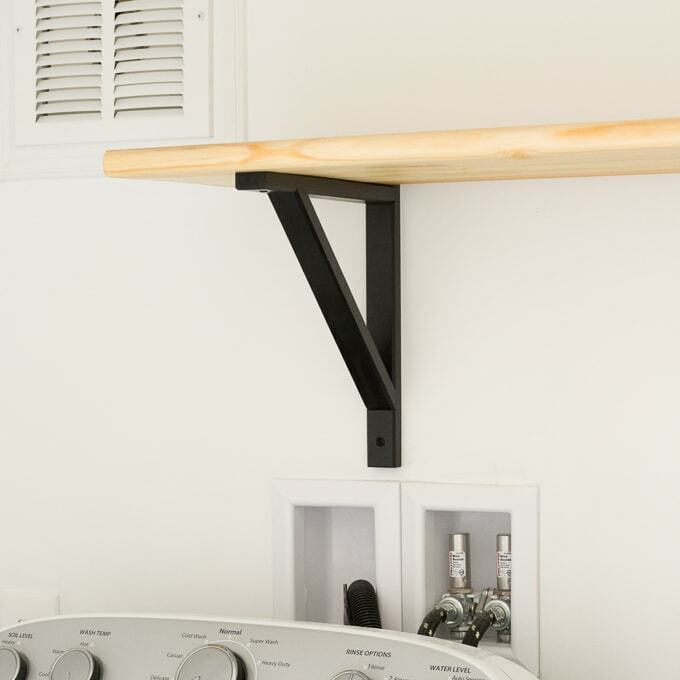 This week I’m sharing the quick and easy DIY I did for an ironing supplies shelf. 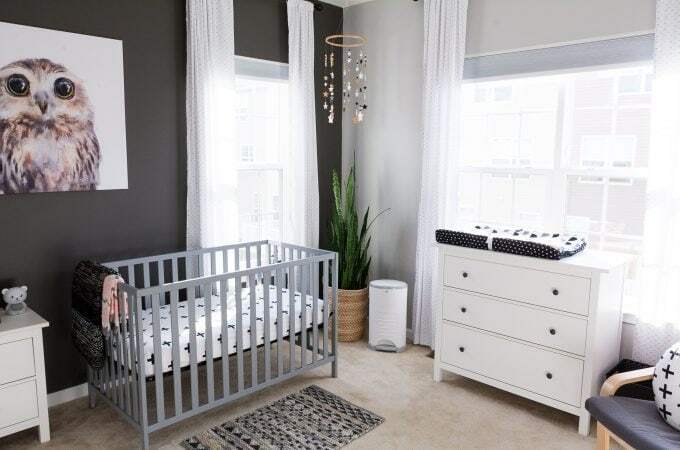 I love hanging things up and out of the way, and this project is an easy way to do that with your iron, ironing board, and any other ironing do-dads you have. Step 1: Sand and finish your shelf piece. I used Minwax wood stain in Natural and Minwax polyurethane in semigloss. Step 2: Paint the brackets and hook black. I wanted to do this so because they were originally oil-rubbed bronze and silver, and I wanted them to match the brackets I used for my open shelving. Step 3: Flip the shelf piece over and use a drill to attach the hook and brackets. Make sure the hook is curving away from the wall. Step 4: Mount to the wall. Make sure to mount in studs or use drywall anchors that are rated for the total weight you’ll be putting on your shelf. Here’s the final shelf hung…and the only thing I had to buy was the brackets! 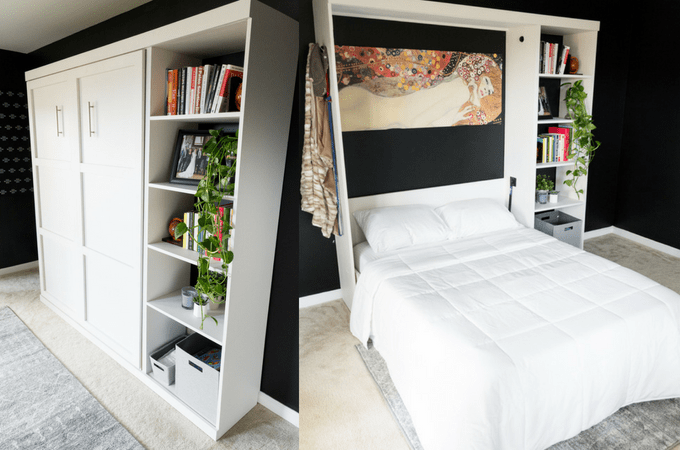 And make sure to check out the rest of the $100 Room Challenge participants’ progress! Smart! Our laundry closet needs some love and this is so inspiring! 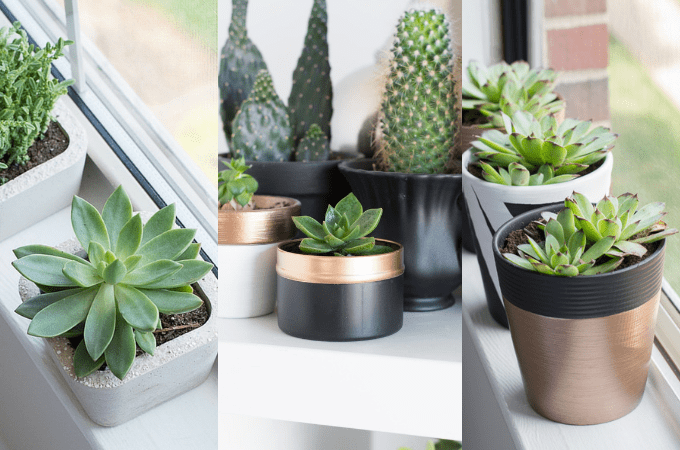 Brittany, this is such an awesome DIY, and for only $3.00! I think even I could do this one :). Pinned! So easy, just some spray paint and a few screws! What a sweet little shelf. I love it. The whole design is so light and airy. I can’t wait to see the final pics. Great job so far. What a great idea!! Function and cute! this looks so much nicer than the inexpensive plastic/wire alternatives. bravo! You are so smart! I would’ve never thought of pieces those supplies together for something like this. 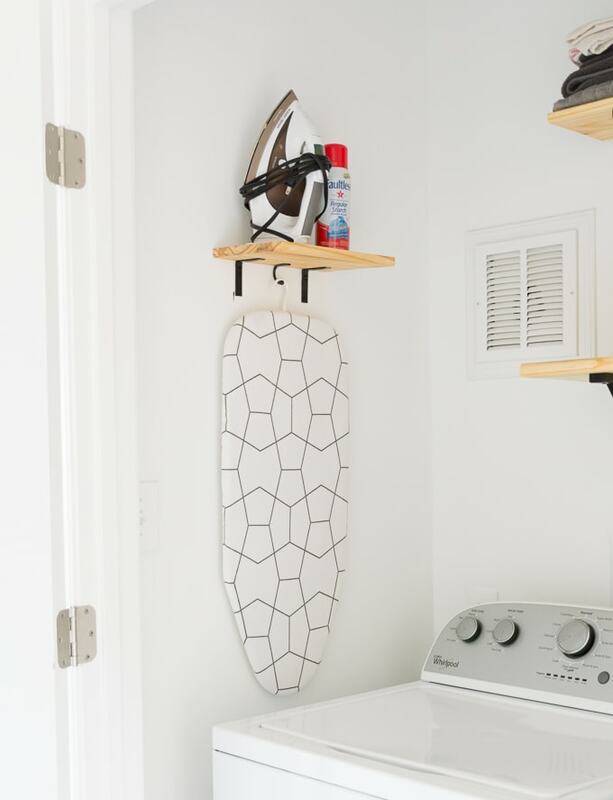 Bonus: your ironing board is hella cute. I have one of these in my closet (not nearly as nice looking), but I love it! (Did not love when a hot iron fell from the shelf and put a lovely burn on my arm, but other than that, love). Yours looks awesome, and I’m tempted to make one and take down the plastic version in our closet. It looks fab! I love the cover on your ironing board. I’m working on an iron/ironing board storage solution too (since I keep it in my craft room because I use it more when sewing than for actual clothes). 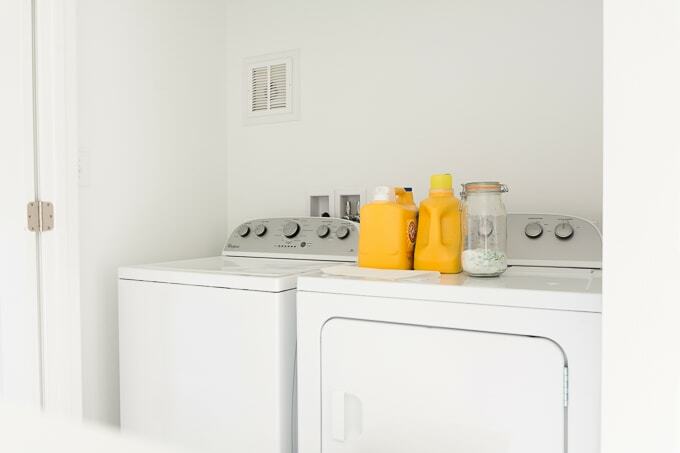 Your laundry nook is looking beautiful! Where did you get the ironing board? I’ve never seen one with that hanger. Does it lay flat on washer? It was either Target or Jo-Ann Fabric and Craft, but it is probably 4+ years old. It can lay flat or you can pop up little feet on the bottom to elevate it a few inches. Perfect solution for someone who doesn’t iron that often. Looks Neat! Love the idea of open shelving! Thank you for sharing with us at #HomeMattersParty .We would love to have you again next week.